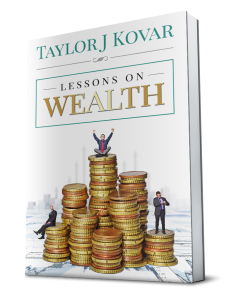 When I first decided I needed to really understand money if I was ever going to become wealthy, I turned to a lot of reading materials. I inhaled books and articles, trying to build a brain inside my head that could compete with the other great financial minds. At the end of the day, it was worth the effort; I built a strong foundation of knowledge that helped with all the future decision I would make. Still, that reading and research was only a small part of my education. All of those books, all of the blogs and radio shows, all of these efforts to find and absorb information didn’t teach me half as much as what I learned from taking action. Understanding commerce is a lot like learning to ride a bike - you can recognize the concepts of momentum and balance, but until you push off and do the pedaling, you’re not really going to understand how that two-wheeled thing stays upright. If you’re going to start your own business, you have to do a ton of prep work. You need to create a strong business plan, figure out expenses and lending rates, conceptualize the type of brand you want to build, and all of this should be done before you try to sell a single thing. And, even with all that preparation, you’ll continue learning and altering your strategy every single day. While you need to experience starting a business before you can really understand it, there are a lot of things that are very helpful to know ahead of time. When I say a lot, I mean thousands of things, but we’re going to limit it to a small handful for now. Your startup launch will face unique challenges, but there are still some universal truths that will help you in the early going. No matter what your business does, expect the points below to factor into your practices in one way or another. And the list goes on and on and on. Whether you’re planning to start renting a room in your house or open a little shop that sells handmade pillowcases, you will work with others in some fashion. To think otherwise puts you in a predicament where you work too much and don’t get enough done. Because we have so much digital access and young entrepreneurs are so tech savvy, it’s easy to think you don’t need support to run a company. While people manage to start and run LLCs and it seems as though everything hinges on one individual, the best businesses have lots of helpers and associates waiting in the wings. I emphasize the concept of teamwork because I really think people benefit from feeling that support. I may run a company called Kovar Capital, and the name could suggest that everything falls on my shoulders, but I have incredible people around me making sure things get done and get done right. In addition to those I work with on a daily basis, I’m connected with third-party companies and freelance workers who are vitally important to the work I do. Could I get by without these relationships? Maybe. Would I want to try? Not in a million years. Before launching a business, think about how collaboration can help your efforts and who you might want to connect with. Consider these collaborators part of your team and do what you can to make sure everyone benefits from the arrangement. As your building grows and things start taking off, my guess is you’ll be really happy to have extra hands on deck. some basic graphic design and get really good at price adjusting. A business has a lot of moving parts, and the owner oversees almost all the levers. One of the most common mistakes entrepreneurs make is to focus too specifically on the one thing they do best. When you work as an employee, this works reasonably well; a lawyer at a firm can care almost exclusively about a certain type of law and a handful of open cases. When you’re a lawyer opening your own practice, you have to handle insurance, pricing, rent, marketing and every other thing that drives your business. Hopefully, you have a team built to help with some of these things. Even so, if you’re the boss, you have to be ready to call the shots. If you pay a marketing director, you still need to have a concept of how branding and marketing work. Before you can settle on an insurance policy for your business, you need to understand the risks you face and how to mitigate those factors. As you consider these bigger issues, don’t forget the smaller matters. You’re going to be sweeping, landscaping, emailing, buying printer paper and registering domain names; you’ll be going to events and fundraisers to pitch your company and dropping off flyers at coffee shops. You might think those efforts are unnecessary, but once you hitch your wagon to a business and need it to succeed, every task, big or small, is fair game. See those petty tasks listed above, like sweeping and shopping and emailing? Wouldn’t it be nice to pay an assistant to handle those lesser details? Don’t pull the trigger on that hiring just yet. You will not launch your business for free. You might get out of the starting gate with minimal costs, but it’s always best to expect the unexpected when it comes to business expenses. If you don’t have a realistic financial model and you spend frivolously, you might sink your enterprise before it ever has a chance. Think about the monthly expenses you deal with in your personal life - phone, internet, electricity, garbage, etc. Those services don’t become free when you rent a commercial space or get an EIN. In most cases, people who need office space pay a premium for dependable services you and your clients can rely on. If you choose to run your company from your home, you’ll likely still need to upgrade some services and pay a little bit more. The point is, smaller expenses add up very quickly, and larger expenses will come out of nowhere and can’t be avoided. You need insurance to guard against a myriad of lawsuits, everything from a person falling outside your front door to an accident during shipment that results in a client not receiving goods in time. You need to plan on licensing fees and all sorts of tax situations you might not have had the pleasure of dealing with before. When you run a company, you’ll find no shortage of places to spend your money. the time you spend cooking and shopping, but is that really a necessary expense for your business? Are you paying more for food because you need it, or because you like the idea of writing it off? We should all beware the company credit card, especially when it belongs to our own company. Since business ventures almost always start in the red, we sometimes accept overspending as a necessary evil. There’s something to be said for having faith in your enterprise and expecting it to succeed; that’s very different than pretending you have a lot more money than you really do. In the areas where it makes sense, try to practice frugality. Don’t buy a fancy scanner because it’s fancy, buy it because you’ll constantly be scanning and sending high-quality images to clients. If you decide you need to wear a suit to the office every day, do your shopping at a suit emporium instead of a boutique tailor who only deals Armani. You may have to go into the red to get your company off the ground, but that doesn’t mean all bets are off when it comes to debt. Your spending should be very purposeful, intended to increase business activity and improve the experience for your clients. If you let your goals drive your expenses, you can expect to avoid unnecessary debt and see better returns in a shorter amount of time. tasks unnecessarily and wasting time on matters that don’t actually matter. Again, when starting your first business, it’s hard to know how to handle all the issues that arise. As you learn, you need to have systems in place that will help you avoid repeating mistakes. The more you can streamline, the better your life will be. For example, when you create a new product or service you want people to know about, you have to communicate that. Should you email every potential client individually? Not if you have a lot of clients. Does everyone get the exact same email or do you have customer tiers? Do you stagger the email blasts so you can keep up with demand? Who’s in charge of managing subscriptions after a mass email goes out? 2 pm leads to efficient and effective time management in the afternoon. You will figure out your systems as you go, and you need to be very attentive to what you learn and apply those lessons in the future. Remember: multitasking and efficiency are not synonymous. If you do three things in one hour instead of doing those same three things in two hours, that might seem like an efficient use of time. However, if the work you do in an hour is subpar and needs to be redone, that’s not effective at all. It’s important to be honest with yourself about the quality of your efforts and how long things really take. You’ll have days when it feels impossible to do your work well, and efficiency gets replaced with a frantic push to get things done. It’s these moments when having strategies and protocol makes a huge difference, reducing that feeling of panic and offering a guiding blueprint for how to accomplish what you need to accomplish. Doing extra prep work for your business launch, even when you aren’t quite sure what you’re preparing for, always makes things easier. You become more efficient, you find your team members, you avoid arbitrary expenses and you get a better idea of the many things that will be on your plate. None of this work and planning is easy, but it will all pay off once your business is up and running.